We have two methods of donation for interested parties. The first is using our Paypal system to make a donation into the foundation on-line through the following pages. Please specify if your donation is a memorial to a family member, friend or loved one as we like to respond to those families whenever possible. 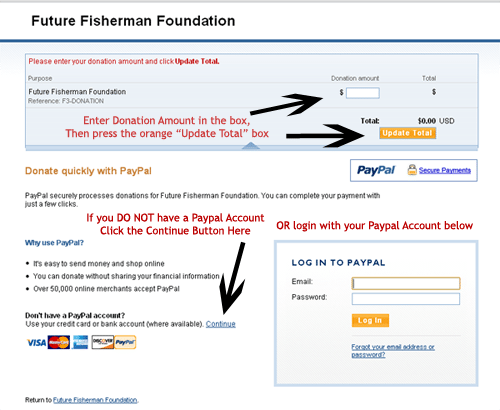 PayPal securely processes donations for Future Fisherman Foundation. You can complete your payment with just a few clicks. You DO NOT have to have a Paypal Account in order to donate online. On the next screen, you will just look for the “Continue” link in the lower left-hand corner. Or if you do have a Paypal Account, you will be able to login after choosing your donation amount at the top. After you press the Donate button below, your screen will look like the diagram on the right. Please view the instruction diagram on how to complete your payment. To donate online, click the Donate button below.